Steam your pudding according to package directions. While pudding is steaming, make the sauce. In a nonstick saucepan over medium heat, melt the butter. Once melted, add flour, stirring quickly to make a thick paste. Cook for 1 minute, continuing to stir (be careful not to burn). Gradually pour in the milk while whisking quickly. Keep whisking until mixture becomes thick and coats the back of a spoon, about 5 minutes. Whisk in sugar and continue whisking and cooking until sugar is completely dissolved. Reduce heat to low and cook 5 minutes, stirring occasionally. Whisk in brandy or cognac. Refrigerate until ready to use, then reheat gently on the stove, adding a small drop of brandy or cognac. 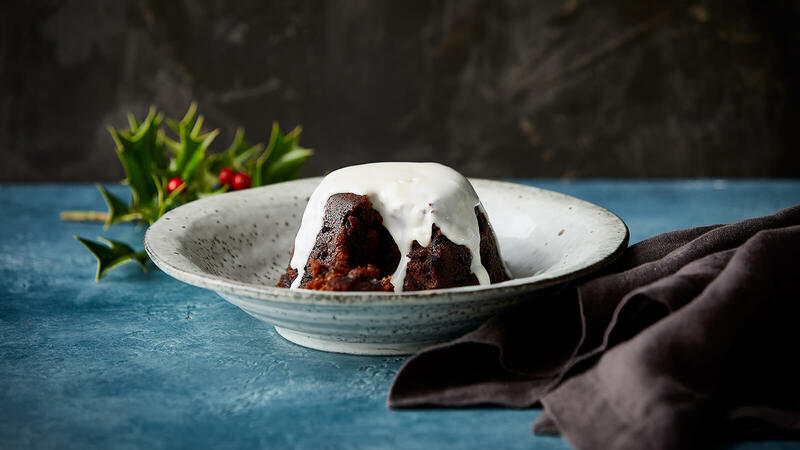 To serve: You want to flame your Christmas pudding. To do this: Place your steamed pudding on a serving plate with a rim around the edge to catch any alcohol that might pour over. If you have a gas stove, pour 2 tbsp brandy or cognac into a long-handled metal ladle and heat over a gas flame until hot, being careful not to let it boil. If you don’t have a gas stove, heat the brandy or cognac in a small saucepan first, then transfer it to the ladle. Light the alcohol by tilting the ladle slightly over the gas flame so it ignites, or use a match, then quickly pour it over the pudding. Wait for the flames to die, then pour cream sauce over top and serve immediately.